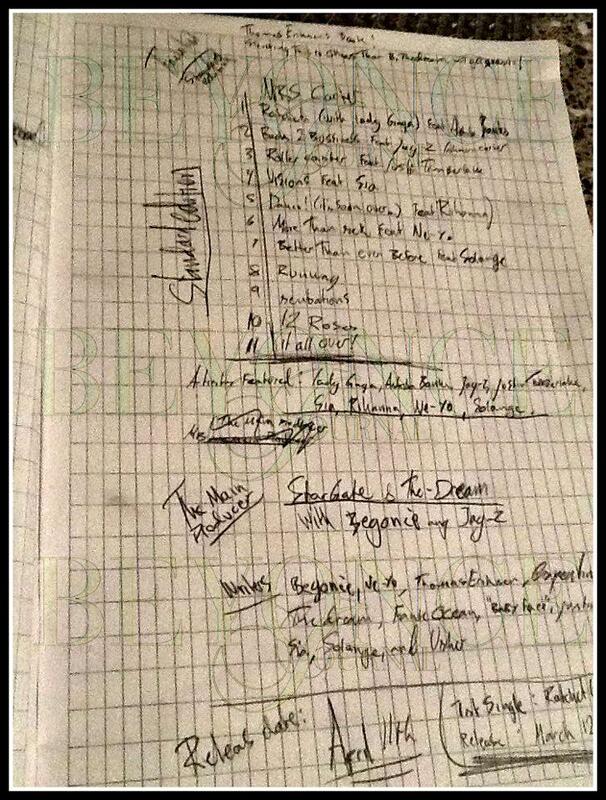 Update: A very reliable source tells us that this tracklist is absolutely fake. Boo hiss. Original story: What’s the latest with Beyonce, you might ask? This morning brought news of a supposed leaked photo from Camp King Bey with all the details on her new album, and it’s probably, almost definitely fake, but it’s like a fan’s most deliriously brilliant fantasy of what this next record could be, and really, what if it’s not fake? What if it’s real? What then? We would be remiss to just ignore it, right? The (probably fake, it’s all probably fake, but ah! What if it’s not?) details are as follows: The album is called Mrs. Carter — which would make sense, given the title of her tour — and is due to hit retailers April 11, 2013, with collaborations from a laundry list of superstars including Lady Gaga, Azealia Banks, Jay-Z, Justin Timberlake, Rihanna, Ne-Yo and her little sister Solange Knowles. The first single, as rumored, would be “Ratchet,” with a release date of March 12. Do you think the tracklist is real? Let us know below, or by hitting us up on Facebook and Twitter!